What started as a shopping trip for office stationary in Mombasa ended with another three boys in our orphanage. A phone call from the Department of Children to come immediately to their offices where three young boys, Moses 5 years old, Caleb 3 years old and little Joshua 2 years old, had been removed from another orphanage where they had been very badly treated. 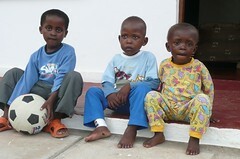 The boys were in a terrible state, malnourished with malaria. 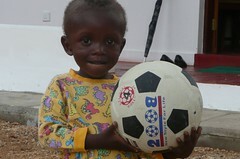 The authorities had closed the other orphanage and the boys had not received a meal for the past 48 hours. Jackie, our manager, cooked the boys a lovely meal of beef stew and ugali which they woofed down. They were very scared and disoriented but had a little play on the swings and slides. We brought them to the local doctor the following morning who took blood tests which showed chest infections, malnutrition and malaria. 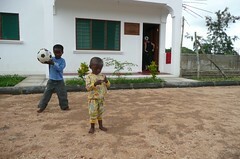 After a struggle the boys received injections and medication to cure their conditions. Their little bodies were marked and when Jackie enquired, Moses told her how they were beaten and burnt by the people who ran the other orphanage. Unfortunately some establishments use the children as a means to get money from tourists, the dirtier & thinner the child, the more money they get. People do not realise they are being conned and often make substantial donations which are just spent foolishly, never on the children or the orphanages. After five days the boys are more settled but still very wary of men. Moses has started the local school and by all accounts is a very bright intelligent boy. It will just take time and hard work to gain the boy’s trust but our team are very committed and with the help of a child counselor we will ensure they receive whatever help they need. What a difference 10 years makes Mary . Looking at the pictures then compared to the strong, confident boys they are now makes me cry with happiness.